This week’s PhotoHunter theme is “Free”. For want of anything better, I will post some recent photos which have to do with the theme. Recently, we rescued two turtles who were crossing the road and in danger of getting squashed. The first we released near a river after taking it for a drive in the car (and getting liberally peed on). The second I wasn’t going to mess with and just rolled it on its back and pushed it to the other side of the road. 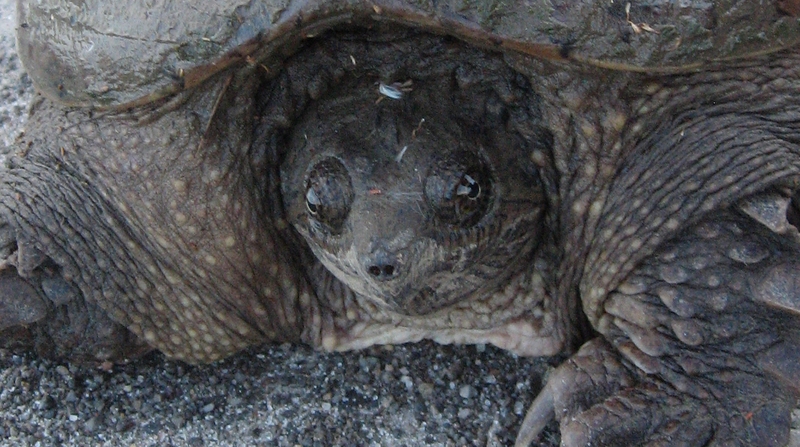 Snapping turtles are endangered and a protected species. 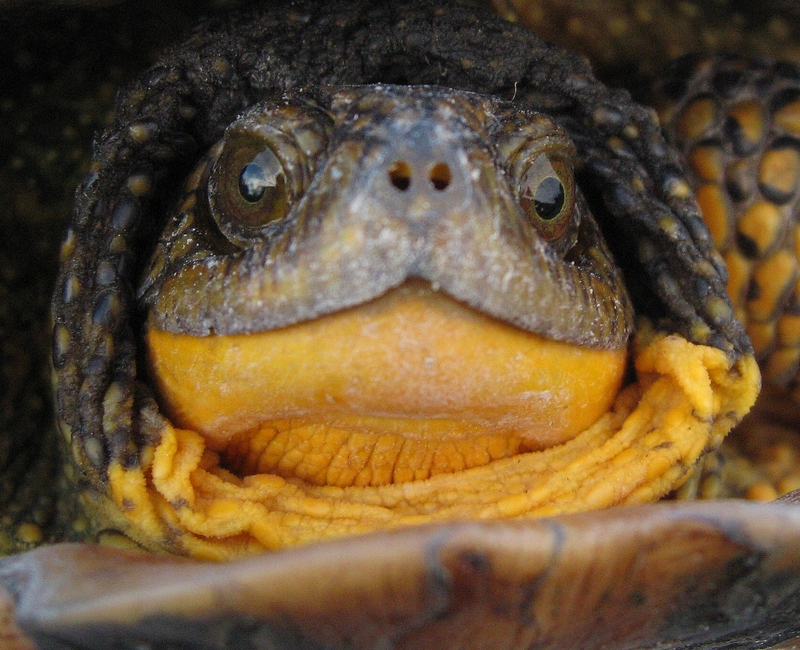 Another look at the Blanding’s turtle. Firstly, many turtles are endangered and the ones that are not are becoming threatened by loss of habitat. 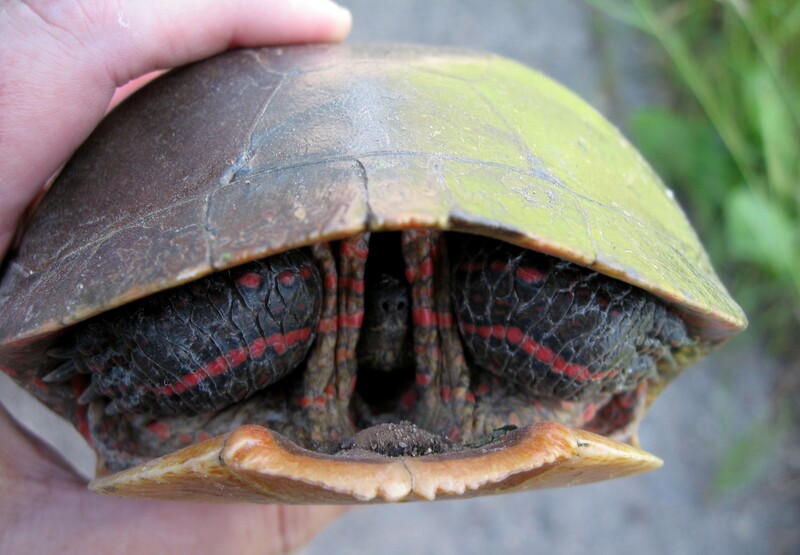 Turtles often have to move across roads to get from one wet place to another, either for mating, for food, or because a pond has dried up or been drained for development. Thousands of turtles are killed when crossing roads every summer, either when drivers don’t see them or by drivers who deliberately run them over. 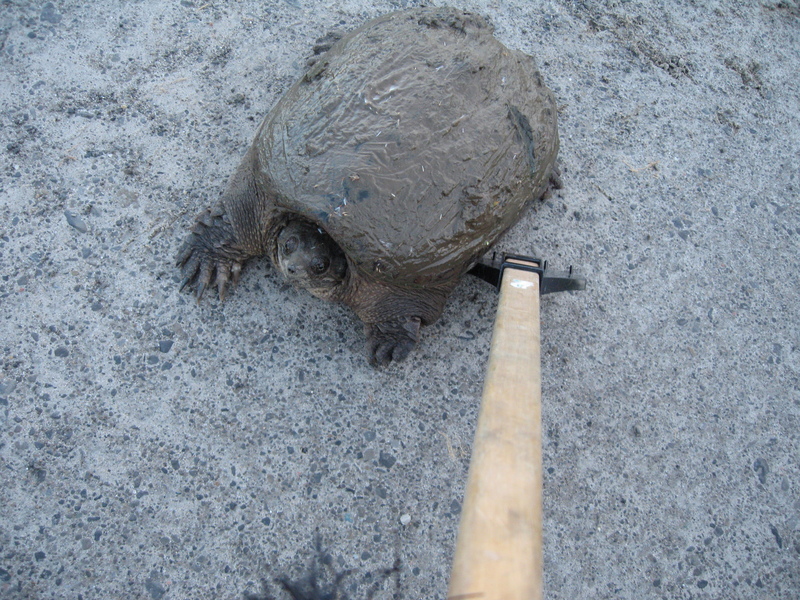 Accidentally running over a large Snapping Turtle can damage your car, as well, or cause a dangerous road situation. Deliberately killing or harming endangered turtles is illegal and if you see someone do it, you should report them. 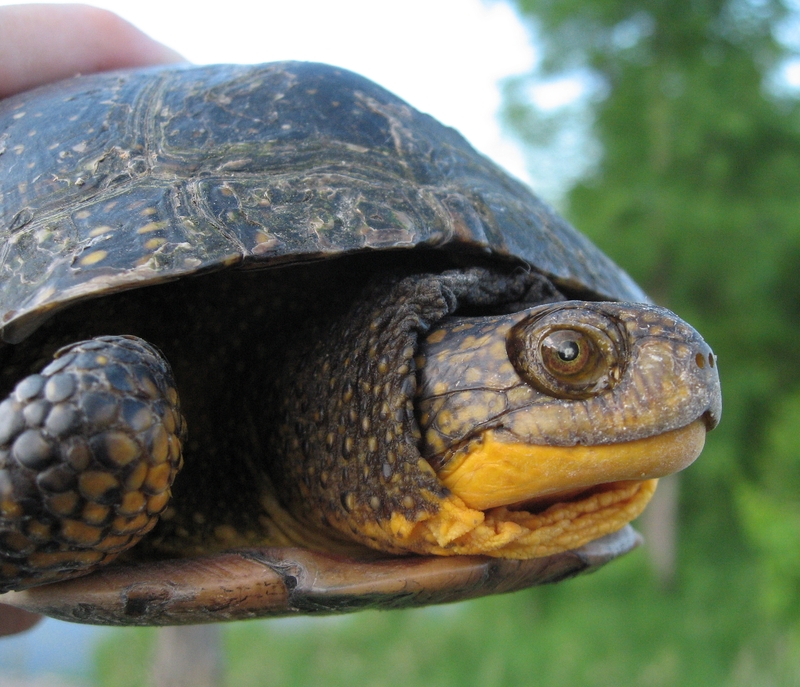 It is usually illegal for you to remove wild turtles from their habitat and keep them as a pet. They are important to our ecosystems and should be left where they are whenever possible. If it is injured, take it to a vet. Moving turtles is relatively easy but you should always keep your own safety in mind. Be careful when you are standing on or crossing any roadway, especially when visibility is hampered by terrain or weather. 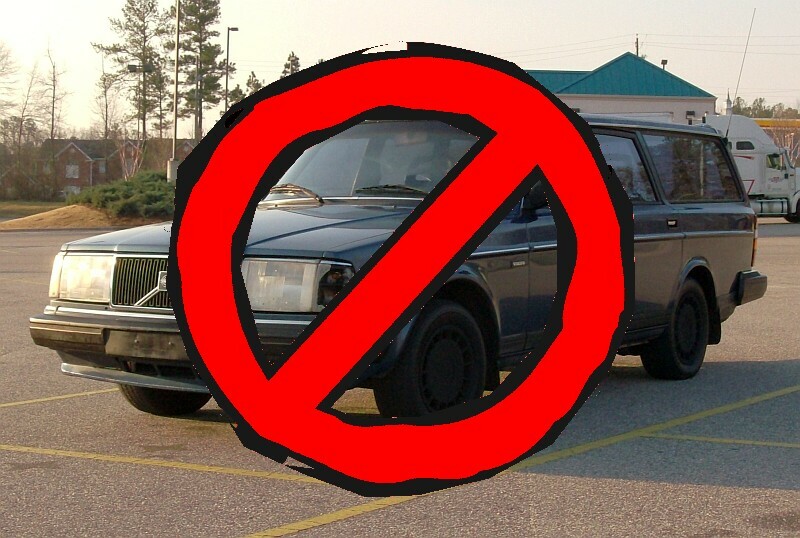 If you have someone with you, have them watch for and alert traffic to slow down or stop. Always make sure that you are putting the turtle on the side of the road that it was heading for and far enough off the road that it won’t try and go back the way it came from. If you know there is water nearby, take the turtle there and release it near the water (not in it, in case you’ve mistaken a tortoise for a turtle or in case the turtle is injured. You don’t want to drown it!). Always use caution when approaching a turtle if you aren’t familiar with the various species. Snappers are extremely fast and have a longer reach than you might give them credit for. NEVER pick a turtle, even a Snapper, up by the tail. You can use the tail to flip a Snapper over but carrying one by the tail can damage the spine. As well, they are heavy and if you drop them, despite their having a thick shell, it can do some serious damage to the shell and it hurts the turtle. Small turtles can be lifted and carried easily but watch for claws and jaws. It probably won’t hurt very much but if you are startled by them, you could drop them. Snappers, if they are small enough can be picked up but you would be wise to wear gloves and, if possibly throw something over them, like a jacket or blanket, just to keep their beak away from you. They have an incredible reach. Flipping them on their back and pushing them to the side of the road is a good method of dealing with Snappers. Remember to flip them over, again!. I used my car brush to push the last one off the road. I have used a large piece of plywood to bulldoze a very large one off the road. I have started carrying a “turtle kit” in the car…. Water (for re-hydrating them and for washing my hands after), heavy gloves, a piece of tarpaulin, and a light snow shovel for pushing them off the road. Many states and provinces have methods of reporting on-line both rescues and people who have killed or injured turtles. Make a careful note of where you were, the habitat, the description of the turtle, any injuries, and where you released the turtle if you transported it. Get photos if you can. I use Google Maps to pinpoint locations and to obtain the longitude and latitude. Since I spend many a summer day on the back roads, I have rescued a number of turtles, as well as other animals, including snakes and injured birds. Every animal saved helps make up for the millions that die on our roads every year.